Moon Meadow Beef - Customers tell us that our beef is the best that they have ever had! That's because Moon Meadow's philosophy is simple: Cattle should be raised naturally, living in herds with ample space to graze, allowing us to bring the healthiest product to your table. Our cattle are raised in large pastures in Pescadero, a small town known for its pristine, rural setting. When you buy Moon Meadow Natural Beef, you can rest assured you are getting high quality, sustainable beef. While today’s conventional meat industry is beset with safety and environmental issues, the natural beef movement is re-taking its right place and becoming recognized as the production method in harmony with nature’s design for both production animals and the consumers of their products. A resurgence of the partnership of growers with consumers has presented new opportunities for producers, and greater confidence and satisfaction among customers who seek and support local business. Knowing the origin and production methods used is a nutritional advantages sought by discerning consumers. 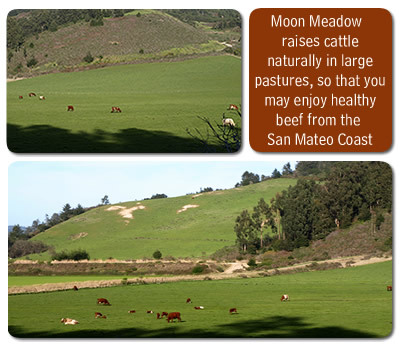 Moon Meadow Natural Beef meets all the criteria for such customers, and guarantees satisfaction in the quality, tenderness and the humane, healthy environment the California coast pastures provide. and it is humanely raised. with Moon Meadow chuck roast. I bought two porter house steaks at the Pleasanton Farmer's Market and I have to say that it is easily the best steak I have ever had!!!! Me and my girlfriend said we were only going to eat half each and save the rest for lunch. Didnt happen we each ate the whole thing. FAT AND ALL! If my teeth could crack bones I would have ate that too!! I want to buy a larger quantity this time and fill up my freezer for the summer! I am starting to wonder what Safeway is selling us as grass fed because it tastes NOTHING like yours!!! I've been purchasing Moon Meadow pork, lamb and beef at our farmers market in Livermore. The quality of the product is amazing. It reminds me of the types of product I grew up with. I will be back again and again, and absolutely recommend them to my friends.